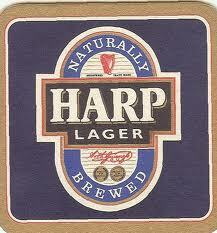 Harp Lager (Harp Irish Lager since 1997) is a pale lager brand owned by Diageo. It is brewed in The Great Northern Brewery, Dundalk for Ireland, the Labatt’s brewery for Canada and the Hydes brewery for Great Britain. In Australia distribution is handled by Carlton & United Breweries. In Great Britain distribution is handled by Bargain Beer Supplies. Harp Lager was first produced in 1960 by The Great Northern Brewery, Dundalk, as a bottled beer, in response to the trend among drinkers in Britain and Ireland towards continental lager. By 1961, it was brewed under an alliance of the brewing companies, Courage, Barclay & Simonds; Scottish & Newcastle; Bass, Mitchells & Butlers; and Guinness. These companies grouped together under the name of the Harp Lager Ltd. consortium. Coming 1964, it was being sold on draught and quickly led in its category for sales. Members of the Harp consortium changed over the years, with Courage and Scottish & Newcastle leaving in 1979, but becoming franchisees. Dr. Herman Muendar, a distinguished German “Braumeister” was chosen to manage the new venture, being eminently suited to the task, having gained considerable experience supervising and directing the re-building of war damaged breweries in the Ruhr area of Germany. And so Harp Lager was born, with the Brian Boru Harp as its emblem. For many years the memorable slogan “Harp stays sharp” was used in advertisements for the Lager. It was written by the advertising executive Rod Allen. In 2005, Harp saw a makeover. Diageo Ireland separated the brand from Guinness and gave it a new look, with new advertisements appearing on TV. Ironically, there is no longer an actual Harp on the design of the new tins and bottles, as that logo belongs to Guinness. US and Canadian sold bottles still bear the Harp logo (2008). On the 9th May 2008, Diageo Ireland announced that they are to close the Dundalk Brewery along with the Kilkenny Brewery over a five year period. Thus ending a long tradition of Brewing in Dundalk. Harp has been a keen supporter of new music talent in Northern Ireland and regularly sponsor live music nights under the banner of “The Harp Ice Cold Big Gig.” In 2010 they used music from three local unsigned bands – Clone Quartet, Ed Zealous and The Jane Bradfords – in an extensive nationwide ad campaign.